In terms of social business maturity, most organizations are “intermediate,” with only 17% who are truly strategic in the execution of their social strategies. The lack of clear leadership, organization, and strategy means that many organizations experience some form of “social anarchy,” of siloed, uncoordinated social efforts. Top priorities for social include scaling for engagement, integrating data, and training/ education around social. Measuring the impact of social is maturing, with over half of organizations able to track the impact of social on marketing efforts. Lack of employee training around social media policies remains a significant risk area — only 18% of companies said that their employees have a good or very good understanding of their social media policies. 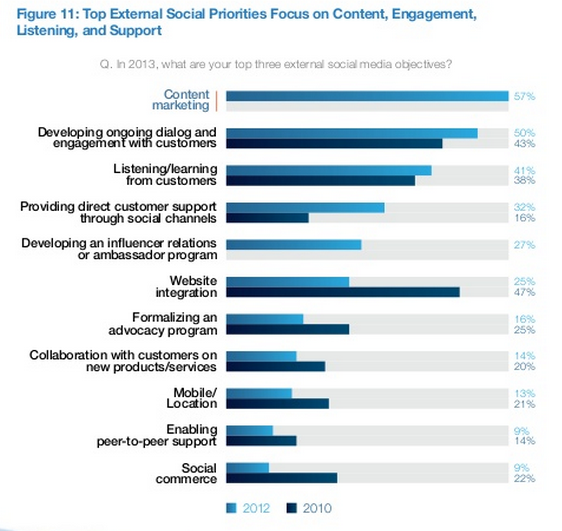 Content marketing is the highest priority for attaining social strategy in 2013. Social advocacy, collaboration, and commerce have become lower priorities. Social and content are inseparable. Your social strategy is part content strategy and vice-versa. Creating content though ultimately means cultivating relationships. As social strategist Jay Baer said, content without advocates is just Google bait.